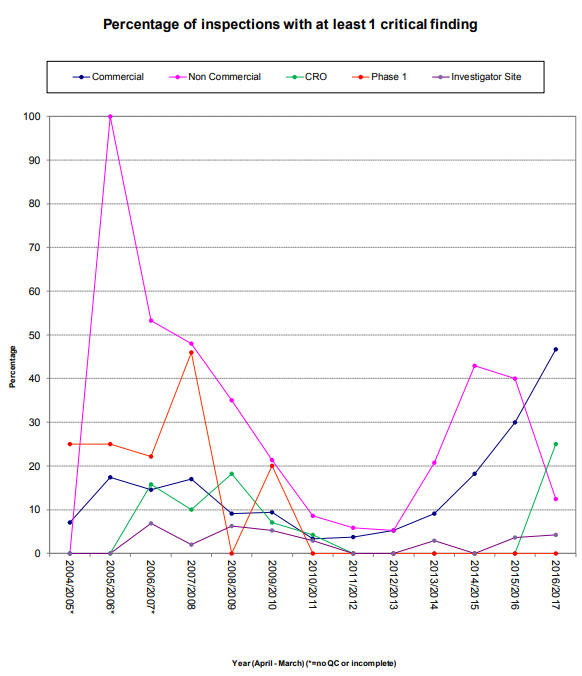 “A total of 16 commercial sponsors were inspected… 7 (46.7%) had at least one critical finding and all (100 %) had at least one major and/or critical finding”. The tables (excerpts from the report) show that both CROs and Sponsors do not usually receive critical findings. Most sponsors, however, received two or three major findings and six or seven other less consequential findings. CROs, fared slightly better with one fewer finding on average, and lower mean issuance of critical findings. The most striking metric, however, shows that all inspected Sponsors were issued at least one major or critical finding. The following graph excerpts from this year’s inspection report show the percentage distribution of findings for the three categories (purple meaning total findings, green being major/other grading, and red meaning major grading). Items labeled 2015-2016 are extracted from the 2015-2016 GCP Inspection Metrics Report. Items labeled 2016-2017 are extracted from the current inspection report. Approximately 14% of major findings and 11% of all findings. TMF related findings represent the second greatest percentile allocation of major findings. Approximately 15% of major findings and 10% of all findings. TMF related findings represent the greatest percentile allocation of major findings and of all findings. Approximately 17% of major findings and 9% of all findings. TMF related findings represent the single greatest percentage allocation for all findings. Approximately 15% of major findings and 8 % of all findings. TMF related findings represent the second greatest allocation of major findings. From this data it is easy to draw the conclusion that the increased guidance provided by MHRA and the increase of adoption of eTMF technology have not succeed in reducing the total number of TMF related findings (and thus may not have sufficiently balanced MHRA’s increased TMF expectations). 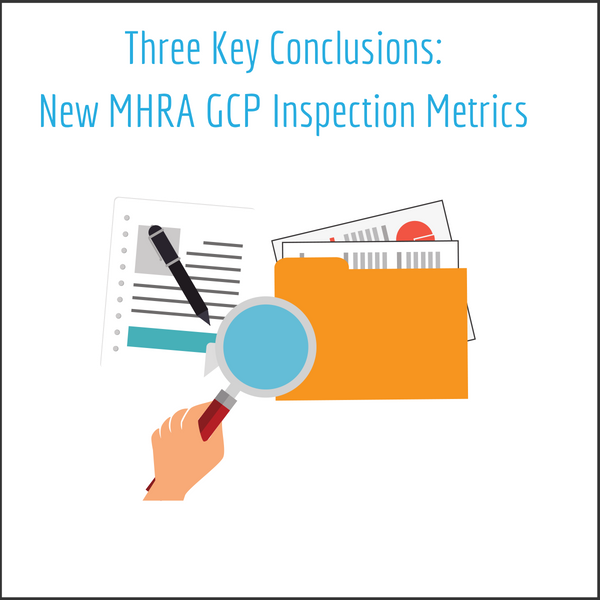 Overall the data “shows a general improvement following the introduction of statutory GCP inspections”, but this trend has not necessarily extended to the Sponsor and CRO. Regardless of the circumstances of the inspection or type of establishment, however, it is clear MHRA sees the TMF as the window into the clinical trial that should not be a final document repository, but “a contemporaneous system used to manage the trial.” MHRA’s focus on the TMF is not simply meant to place a greater burden on those who conduct clinical research but stems from a clear truth: a healthy TMF is the basis of a healthy and compliant trial.